It's a pack-and-go LED moonflower package that comes complete with its own carrying case. Four individually controllable heads in clear casings can be aimed to fill any room with red, green, blue and white beams. The mounting bar features a pass-through to allow the unit to be quickly and easily added to a tripod or speaker stand. 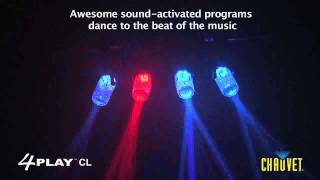 Considering purchasing the Chauvet 4 Play CL Clear LED Moonflower Package Set? Have questions? Ask people who've recently bought one. Do you own the Chauvet 4 Play CL Clear LED Moonflower Package Set? Why not write a review based on your experience with it. 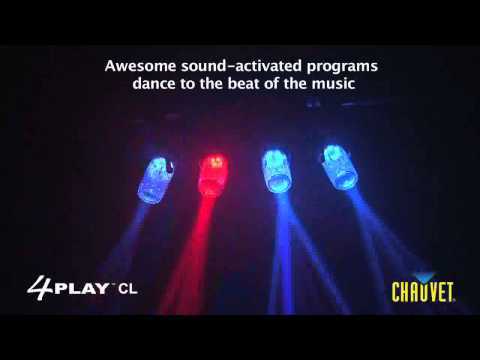 Seen a video for Chauvet 4 Play CL Clear LED Moonflower Package Set online or have you own video? Check out Chauvet 4 Play CL Clear LED Moonflower Package Set on DJkit.com!